Today’s downloads provide a spreadsheet providing Ultimate Limit State (ULS) analysis of reinforced or prestressed concrete sections, and an iterative method for finding the depth of the Neutral Axis in a circular reinforced concrete section. This entry was posted in Beam Bending, Concrete, Excel, Newton, UDFs, VBA and tagged Brents method, Excel, Prestressed concrete, Reinforced Concrete, UDF, ULS Analysis, VBA. Bookmark the permalink. In ULS Design functions possible to define only Axial force? What about moment ? As hadwao says, the input is the axial load and the tension face, and the output is the maximum bending moment allowed with that axial force. 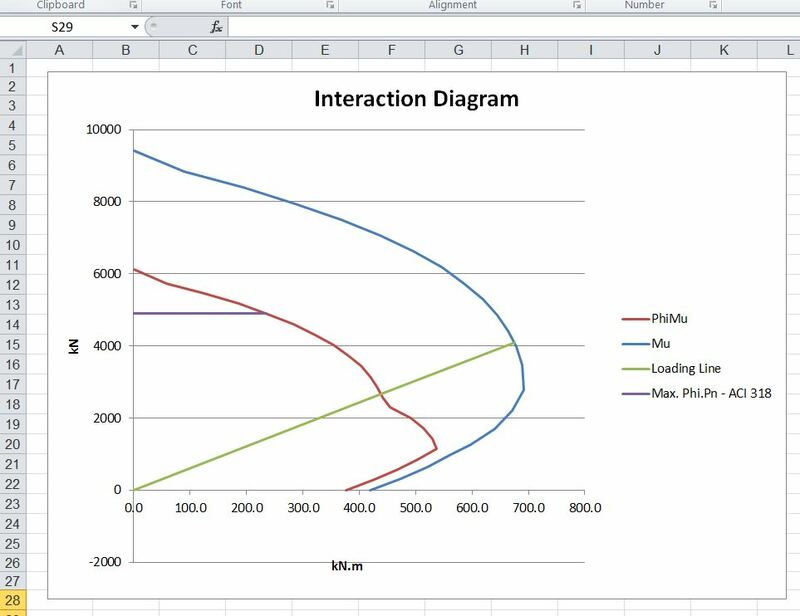 You can check the design moment capacity (phi.Mu) for any specified axial load, or you can use the interaction diagram to check that any combination of P* and M* is within the area bounded by the capacity line (the red line). OK, I understand 🙂 Sorry for stupid question! Is it planned in future to add check according to eurocode 2 in ULS design functions? Yes, I hope to do it in the not too distant future, time permitting. Thank you. It would be great and usefull. At least for me. Maybe it is too much, but when it is planned to add design according EC2? It looks like there no need too much changes in code to add EC2 check (principle the same?). Also in Australian codes there is phi to find design bending and axial load capacity? What is the reason, in EC2 no such thing. There are some fairly major differences between the EC 2 approach and the Australian (and American) codes, but I am working on it. In EC2 the concrete and steel strengths are factored down (by different factors). In AS 3600 the calculation is done using the full strength, and the resulting bending capacity is then factored down, by a variable factor depending on the axial load. See https://newtonexcelbach.wordpress.com/2013/07/10/concrete-uls-spreadsheet-update/ for new version including Eurocode 2. Just the rectangular stress block at the moment. The parabolic-rectangular block will follow eventually, but that will need more work. I’ll have a closer look later, but for now if you enter a very small axial load (like 0.01 kN) it will solve OK. The example metroxx sent was giving the wrong result for an axial load of exactly zero. The problem was in the routine to find the position of the NA, where a cubic equation was giving a result of a very small positive number, rather than zero, due to round off errors. Now fixed; see reply to hadwao. hi. These days i have been consulting your spreadsheets. i have to contratulate you for your work. in the past, i have tried to make a routine to design concrete sections, with vba, but i never tought about using the excel array functions to automate the process. 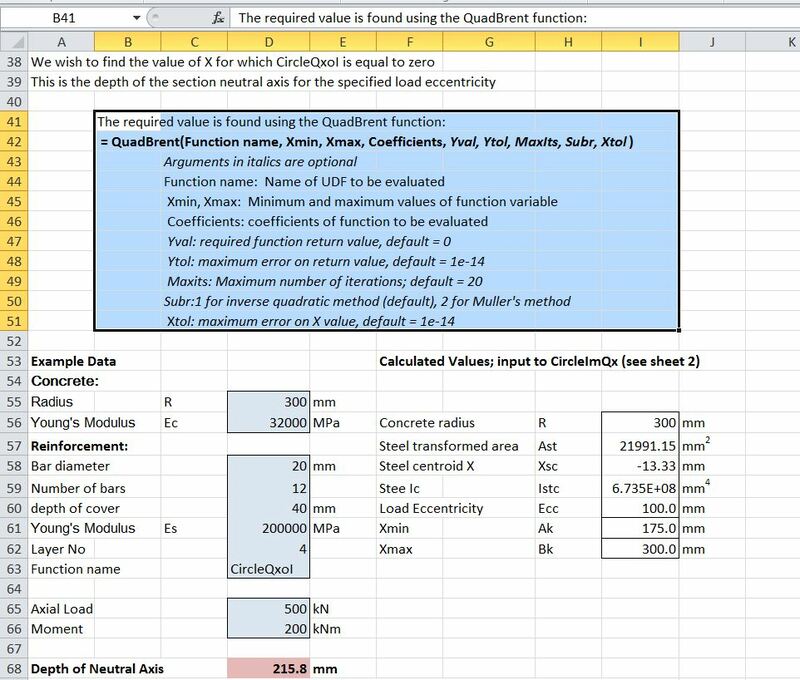 i would like to ask you a question: in the spreadsheet for uls concrete section design, the spreadsheet is setup in such a way that it takes the section data with the reinforcement areas, and then it return the ultimate bendin moment. that way, it would be possible to take data output of a fea software, like sap2000, or csibridge, and with your spreadsheet, and obtain the reinforcement in a matter of second. again, your spreasheets are impresive. I will have a look at calculating the minimum reinforcement area when I have time. The reason I haven’t done it before is because the way I work is to set up a table (or tables) of section details, including reinforcement, and plot graphs of section capacity and design bending moment and shear, and adjust the reinforcement so the capacity line is always outside the design action line. If there are a large number of different load cases with different axial loads I also sometimes plot all the design actions on a moment (or shear) – axial load interaction diagram, and again adjust the reinforcement manually. But the minimum reinforcement area will be an interesting exercise, and will also be useful, so I will have a look at it. At the moment the revised functions are in the RC Design Functions spreadsheet, that does SLS and ULS design for rectangular sections with two layers of reinforcement, but I will look at adding the same functionality to the beam design spreadsheets. I am a really big fan of your work, makes life easier as a structural engineer esp checking the big softwares which act as black box. That being said…. I am currently working in Germany, and have to use Eurocode essentially the limit state deisgn concept is the same but with some implementation differences. Can you tell me which of the files regarding design have you changed/modified for EUROCODES 2 especially. for ULS deisgn of concrete structures/members. The main spreadsheets for concrete design are RC Design Functions and ULS Design Functions. RC Design Functions includes both ULS and SLS functions that will work to Eurocode 2, but is for only rectangular sections with 2 layers of reinforcement. ULS Design Functions will do any shape that can be split into rectangular or trapezoidal layers, but only does the rectangular stress block to the Eurocode, and only ULS design. See the Downloads page for free downloads.